Here's how to make the best ever bunny cookies for Easter. Roll out your chilled cookie dough. Once your cookies are out of the oven and cooled you can begin the decoration. Prepare your frosting and colour it a bright white. 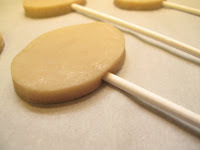 Outline your cookie by circling around the edge of with your piping bag. Flood the centre of your cookie with royal icing and spread it to the outline. For the ears, cut your fondant in an ear shape. Make sure the head and the ears are laying flat on the baking paper. 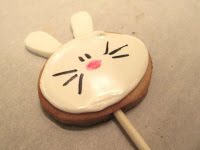 Voila, now you have your cute little bunny cookies for Easter.